Motivate would add Citi Bike to Staten Island and the Bronx for the first time in exchange for exclusivity on city streets under a new proposal. NEW YORK CITY — Facing the possibility of competition from new bike share operators, Citi Bike's operator said Wednesday that it may add docks to Staten Island and The Bronx for the first time under a new proposal being considered by the city. Motivate — which runs the service — would add 6,000 new bikes across the city and expand to finally cover the entire five boroughs with no extra public funding in exchange for the city loosening regulations and extending the company's exclusivity deal, someone with knowledge of the proposal told DNAinfo. The proposal was first reported by Politco New York. Under the proposal, two-thirds of the new bikes, or 4,000, would go to neighborhoods that haven't been a part of the system yet, including Staten Island and The Bronx. An additional 2,000 bikes would go to shore up service in existing neighborhoods, the source said. The proposal comes as at least five other companies are hoping to set up their own bike share operations in New York City, the Post reported in April. In exchange for the new bikes, Motivate is asking the city for several concessions, including an extension of the agreement that allows only Motivate to run a bike share on the streets. They also asked for a small increase in advertisement space on docks, an end to certain fines and fees — like paying the city to recoup former meter costs where docks are installed — and the ability to implement more flexible pricing, like the ability to rent a bike for an hour at an additional cost. At a transportation budget hearing Wednesday, Department of Transportation commissioner Polly Trottenberg said the agency has been in talks with various companies over getting bike share in all boroughs. "It is a fast moving field," Trottenberg said. "When New York City commits to a plan of action with a contract I want to make sure we get it right." 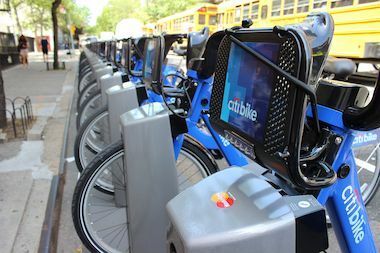 The bike share service system has already launched in Manhattan, Brooklyn, Queens and Jersey City, but their blue bikes have not made it to Staten Island and The Bronx yet. Elected officials and advocates previously called on the city and the company to bring the system to the entire city, with Borough President James Oddo writing a letter to Motivate in 2015 to build docks at the St. George ferry terminal, Snug Harbor Cultural Center and in front of the URBY development. "As a Staten Islander, I’m tired of being left out whenever new and exciting transportation announcements are made. Citywide Ferry Service, BQX, Citi Bike, the list can go on and on. So, when Citi Bike comes out and says they have a plan to bring the service to Staten Island, can anyone blame me for wanting to get it done?," Oddo said in a statement. "Our North Shore waterfront area is in the middle of a transformation before our very eyes that will make it the hippest waterfront in the city. Citi Bike would be a perfect complement to that." Trottenberg previously said expanding the system to Staten Island would be difficult because the stations would be harder to get to for workers who distribute and maintain bikes. Citi Bike has been backed by corporate sponsorship, not public money, so far. Councilman Ydanis Rodriguez pitched a plan last year that would kick in public money to expand them to every borough, but the company's latest proposal would do it without taxpayer funds. Motivate officials did not have an estimate of how much the new expansions would cost or where they're eyeing to put the new docks.